The Journey To Kill Everyone In Dark Souls. Yes, Everyone. 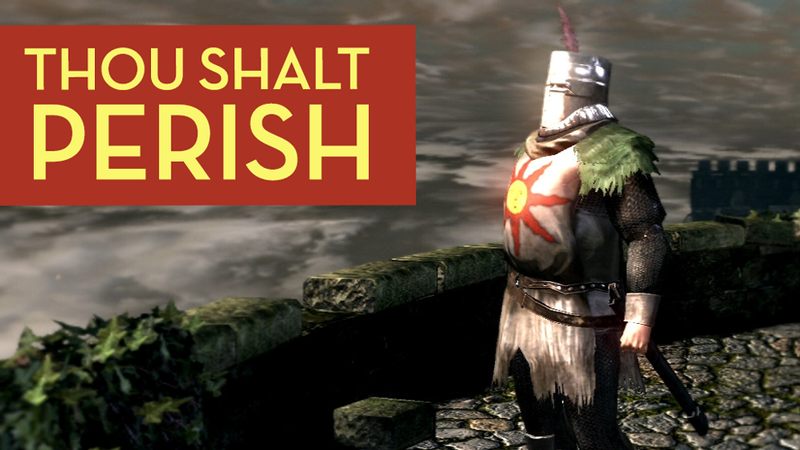 Months before I had played Dark Souls, I came across a list of things that players should finish up at the end of their first playthrough: fight optional bosses, farm humanity, collect and upgrade weapons, kindle bonfires. Trade for useful items, level up covenants. Then, quite simply: kill everyone. Those two words stick with me all the way, but I’ve postponed the massacre. I’m not really that kind of player: I’d rather keep everyone alive, taking any inconsequential companionship over what could be frisked from a warm corpse. I’ve built bonds with everyone in the world, narrow links that kept me going through the tough time. Not because anyone is perfect, but because we’ve all suffered in the same way. A clutch of tarnished souls, muddled minds together in the dark. Lordran is not a nice place. It holds no mercy and sustains no love. It waits with ceaseless patience for an approach, an attempt, a mistake. It touches everyone—we’re all the same. I find myself hanging around the side rooms and alcoves longer than necessary, spaces that someone else has found safe enough to pause. We take a moment to gather ourselves, like two strangers smoking outside the pub in winter rain; a sullen, shared camaraderie. It doesn't take much—a few words, a few dead echoes from the wet walls—and I know they get it too. We're all on the same level, because it's impossible to get anywhere in this world without understanding. I don't want to kill these people. With the game’s relentless saving system—progress constantly overwritten, a cycle every second—I can’t lash out at someone and then scurry back to an old save and pretend nothing happened. Yet despite everything, the temptation still grows. It's a mystery denied by my affection towards the characters and my dread of the permanence of the action. But now my journey is nearly over. There's not much time to see what may happen, and though the friendship of my fellows served me well through the game, I feel stronger than all of them now. Above them. I’m not frightened any more. I am armed with a scythe I chose just for a change from the claymore than had served me well for most of the game. My face is hidden in the shadows of a cloth hood I chose to stay agile and acrobatic. I have armed and armoured myself a reaper. Combined with the confidence gained from overcoming so much in the world, it’s the push over the edge I need. I had rescued Big Hat Logan from behind bars twice in my journey up through the world. He always seemed grateful for it, if slightly distracted in the way of an old professor, eager to get back to work in the face of any set-backs. The second time we were both imprisoned in the basement of the Duke's Archives, a grimy stone spiral with old stacks of books rotting between the cages and broken machinery heaped upon the floor. Discordant music stirred monsters into a swaying procession up the stairs. I could have left Logan behind, but I hoped further rescue might bring further reward. When I found him he was sitting happily, half-camouflaged amongst the toppled tomes in a room behind a secret door. Hat blending in with the books, I’d actually walked past him a few times. I felt momentarily pleased with myself to have helped someone get where they wanted to be, one thing that worked out right for someone in this merciless world, content amongst the archives. No longer the friendly academic, he abandons his spot. The crystal magic he sought after and specialised in has twisted stronger souls than his. The Duke of this place I killed myself, made a grave of the glittering cavern he carved out underground. I find Logan again in the highest tower, in a room not lined with books but consumed by crystals. He’s gone, turned hostile, and I play the merciful angel of death instead of the merciless reaper I had envisioned. A single swipe frees him for one last time. He’s not the only person I've had to put someone out of their corrupted misery, and he won't be the last. Minds are fragile things, Lordran the worst place to test their breaking point. Logan held no great wealth; just a nice hat and the sad arc of a man who reached too far. But sad arcs are no rare thing. Many people have fallen in a similar fashion, a curse upon them—upon us all. We are undead and as such destined to fall into madness, our bodies slowly corrupted and our minds ruined in the process known as hollowing. The Undead Merchant is surviving still. Halfway hollow, his skin looks burnt up or rotted away. Skeletal, dessicated, destroyed, but he’s still lucid, and I as I cut him open I know how he kept his mind intact. "Why, me? ... little Yulia ..."
I don’t know who or what Yulia is, but he held it dear enough to invoke it with his final words. Something loved - something to live for. If anyone can keep that in their heads, in their hearts, they might stand a chance of surviving this place. Most humans have a different way of surviving, clinging to the bonfires scattered throughout Lordran. Hollowing can be reversed for a short time by sacrificing humanity into these pyres. The body becomes healed and other worlds—other players—can be reached. Some will come to aid and some to fight, but whatever the reason that flame-forged connection seems to push back the isolation of the curse. Not so alone any more. The fires are dying, sacrifices barely sustaining the embers. Something more needs to be done, something bigger, and through the game I have become the one to do it. I make my way back through Undead Burg and into the Undead Parish. I spent hours here at the beginning of my journey, nervous, slow and scared. Just seeing two enemies together felt like an overwhelming challenge. Now they are a joke: their movement so slow, their attacks so sluggish that it’s hardly worth the effort to stop and kill them. I’ve moved beyond them, beyond most things and most people too. There’s little left to challenge me. Andre the blacksmith thinks I’ve turned when I attack him. After everything we’ve been through, I can’t say I’m surprised. He’s wrong: I’m not hollow, I know exactly what I’m doing. I take the hammer that falls from his hands, a little token of him left behind. On the church rooftop, beneath the first Bell of Awakening, I clear the sin and betrayal from my slate through Oswald of Carim. He who accepts all with open arms and a little chuckle. Sins for souls. Scythe swing. Staining my record again. But that doesn’t matter. It was only the betrayal I needed to erase so that I could rejoin the forest hunters covenant and get the merchant Shiva to appear, and then murder him in the green gloom of Darkroot Garden. His shrouded, silent bodyguard was the single person I killed on purpose, the act which got me kicked out of the covenant in the first place. Shiva sells a fine range of weaponry and I take one of everything round out my collection. Then he's dead, and I've sinned again, exiled again, back where I started- but the world's a little emptier now. Another player invades my world for this second betrayal, a protector of the forest. Sometimes it seems like there’s thousands of them crawling between the worlds, seeking sinners. It is an edgy fight but they come out ahead, stabbing me in the back when I try to push an advantage too far. Then Rickert, behind bars by his own volition, a self-inflicted prison offering protection from everything outside. Against the ghosts of the drowned city of New Londo, these walls would raise no defence - but it’s the more solid things he’s most scared of. Finally the giant blacksmith, who I take no pleasure in attacking. He remained the only point of warmth and friendliness in the mountain-top city of Anor Londo. A shining, brilliant place, built of smooth pale stone, flooded with sunlight and terrors. Four deaths, four hammers to place in my collection beside blades and whips and claws. Once, the thought of losing all the blacksmiths would have terrified me, but now I carry everything I need along with me. In the same city, not too far away, is Princess Gwynevere’s chamber. Sunlight filters gently through the gossamer across the window, filling the room with a warm orange glow. Gwynevere reclines, smiling gently, the daughter of a god. On my first visit I had proved myself against the bosses in the previous room and she gave me my true task as reward—to get the fires burning fully again. That marked the point when I finally felt more in control of things—more content inhabiting Lordran. No longer a stranger. At the top of the world, I thought I knew how things worked, and my confidence continued to swell. Until now. That twilight has spread across the whole city. It’s not just dark, but empty now. I have to admire the illusion - it wouldn't have worked any other way. If the city was empty from the start my suspicions would have been raised, waiting for an ambush. So the walls crawl with knights and imps, demons and devil archers. The fight before I met Gywnevere was the hardest challenge I had ever faced, and so with the heady rush of victory her talk about my destiny felt well-earned. I bought every word. Revealing this new truth sends a shiver through my confidence, in myself and in the task given to me. If everything was illusion, perhaps the fires shouldn’t be rekindled at all. This is no way to live, chained to embers, living on hopes and sacrifices of humanity - a darkness without flames might be fatal, yet it might also be free. But that decision is still to come. Right now I can focus on my own task and the simplicity of blades. The Anor Londo firekeeper is waiting for me in the darkness outside. She used to lean nonchalantly against the wall, but now she wants my blood. Not hollowed, just aggressive, in on the illusion. She enchants her weapon and parries a few strikes but it’s not enough; I take her soul. Her boss dies too - Gywndolin, the Dark Sun, who fights by throwing up more illusions, these no harder to break than the first. Three curses: Logan’s last words, the fate of the undead, and now the condemnation of fallen gods. But it’s too late to stop me now. I dip back into Sen's Fortress, a crumbling tower filled with traps and lizards and narrow ledges scored by swinging blades. I take a risky leap across a broken bridge to reach the one survivor here. I don't know his name but I do remember liking him on my ascent, despite the few words we shared. He had a fine selection of wares to sell, but it was his personality I liked the most. I still felt new the first time I came up—wary, cowed. I could appreciate his attitude, the sharp sarcasm and dark humour used to deal with the world. With things so bleak, there's little left to do but laugh: we shared a sneer, I felt relieved. Things have changed. Now all I see is the fear beneath his words. He came this far in the world and could go no further, reached the heights of the crumbling fortress and stopped. I related at the time because it felt like my own breaking point could arrive at any moment, and I’d be stuck too, making the most of my rut. I’m not afraid any more. I’ve gone further, slain lords and dragons, extinguished suns. He just seems a little sad now, hiding in some half-hidden room. But I admit, I find some regret in killing him. The company was welcome as I ascended, a long time ago. I may not have started this task if I had known I'd have to finish someone I had really liked. The two men I liked the most are already dead: Knight Solaire by my own hand, Sir Siegmeyer by the blade of another. I first met Solaire standing on the castle walls in a little pocket of quiet between demon and dragon. He offered his help freely, a rare and selfless act in this world. I accepted eagerly, taking him with me against many bosses along the way and finding him not just a reliable friend but a powerful warrior. He was turned away from me, staring out at the rippled grey clouds as the sunlight laid a wide and blinding smear across them. Our paths crossed and then separated many times as I faced my challenges and he scoured the lands for a sun of his own. An odd task, one taken up with a cheery resignation that eventually it might all go wrong. I froze—panicked a little. Still no way through, and my friend in trouble an impossible few feet away. By the time I found the same passage from the other side it was far too late. Solaire came running out to meet me. I learned early on that nothing friendly moves towards you. He came crowned with something new, not Hollowed, tricked and twisted by something crawling down there in the heat. I hated the two swings it took to finish him. He never found his sun. He died the furthest from it a man could get. I hated the world too. Sir Siegmeyer was another friendly soul, in a bumbling endearing sort of way. He always looked a little out of place in his barrelled Catarina armour, helmet domed up like a silver onion. His attitude seemed impervious to the world's leeching misery, his warming cheer always boosted my own defences for a while, a bonfire unto himself. The last time I saw him alive was in Lost Izliath. We fought side by side in an easy battle and I left him standing contented, ankle-deep in mud. I met his daughter Seiglinde too, who had come to this land to fetch him back. I spent a chunk of the game trying to bring them together, but they always seemed to just miss each other, paths not quite crossing right, until the last time. Ash Lake is a strip of white sand that winds through vast, dark, tree-pierced waters. A stone dragon slumbers passively before a bonfire. The giant skull of some unknown beast sits upon the cinder shore. Seigmeyer's body at his daughter's feet. “My father ... all Hollow now ... has been subdued. He will cause no more trouble. As I run across the sands again now, it's a great relief to find them empty. She took him home. There’s no-one to come for me, and after losing the warmth and the aid of two friends I never feel quite the same. Onward to Blighttown, the festering swampland pooled at the world's feet. I kill Queelag's mute and mutated sister, strung up in strands of web. I kill her corrupted guardian, consumed by maggots. The third sister, Quelaana, is somehow free from the curses of spiders and worms. She still stayed close to her siblings, sitting cross-legged on a narrow bank of mud before the rolling marshland. Quelaana taught me the highest level pyromancies. Pyromancy is considered a crude magic here, powerful but unrefined. All fires have served me well and I’m thankful for everything Quelaana taught me. I buy everything she's got left to offer. I show her how well I learned. I head back up, back out again, towards Firelink Shine and the final clutch of lives remaining. This place is the closest thing Lordran has to a safe haven. Everyone ended up here, if only to rest for a while before moving on. I attack the great primordial serpent Frampt but my strikes have little effect. He just leaves in a foul mood, disappearing into the hole that leads down the the Kiln of the First Flame where my journey is destined to end. I kill Patches with some pleasure. In the pitch dark of the Tomb of the Giants, he shoved me into a hole and I burned up an innocent as I tried to save myself from her hollowed body guards. Patches only feigned repentance when I emerged again, anything to save his own skin. The world fits him perfectly: cruel without reason, outcomes of little concern. Things happen or do not happen, issues of responsibility a strange concept. His death shows I have fallen to his level, the world’s level, at last. No care for others, only myself. Everyone is dead, except me and Anastacia, the firekeeper at Firelink Shrine. "Each Fire Keeper is a corporeal manifestation of her bonfire, and a draw for the humanity which is offered to her. Her soul is gnawed by infinite humanity, and can boost the power of the precious Estus Flask." She sits hunched up in a small barred hollow beneath the fire. My favourite character of all, though I can't place why: everyone is mysterious, sketched out with lines that point to other places, other mysteries, but Anastacia more than all of them. She is hushed, burdened. Wretched, desperate. She was murdered once, but I brought her back—the selfishness of such an action only obvious with hindsight. All I wanted at the time was the fire back, Firelink warm again. “Frampt has told me of you. That you have agreed to link the Fire … I thank you, sincerely. Finally, the curse of the Undead will be lifted, and I can die human. I am powerless, but I will do all that I can ... Please, save us all ... Please ..."
I don't want to kill her, but I know she wants to die. I throw a fireball in through the bars and ... nothing. She doesn't even react. No movement, no dialogue. No release. I could have easily not brought her back to life, or I could have accidentally used her soul for something else and I'd be all alone in the world. Dark Souls wouldn't care if I murdered myself into a corner. Anastacia sits as a symbol, of humanity and the human's place in the world. Invincible thanks to the bonfire, but enslaved by it, forced to feed it humanity to keep the flame burning. We are trapped, but if it'll let her die, maybe it’s right to link the fires, even after knowing the deception of Anor Londo. Maybe that link will reset the cycle, rekindle everything and keep it burning long enough to free the keepers from their duties. All fires die down in the end, and all cycles come full circle. Even if she is freed, at some point humanity will be here again, at the same point. Leashed to embers, controlled by lords and gods and kings. I’ve had enough of them. I had forgetten someone. At the water's edge in Darkroot Basin there is a summoning sign. Unlike all the others, this sign is visible even though I am hollowed. And unlike all the others, this one summons someone for conversation instead of combat—Dusk of Oolacile, who sells odd magics based on silence and deception. I found her trapped inside a gold-crystal golem at the far end of the basin, the wide waters beneath the forest sprawl. Alternate realities are layered on top of each other: players moving as phantoms between them to hinder or help. I had to invade a character's world to get Anastacia's soul back, and other legendary adventurers have invaded here. Ghosts flicker in and out, the captured actions of players just before their deaths. Shadows gather in around the bonfires, all worlds separate but tenuously linked, everyone aware of the connection. Time doesn't pass, Lordran stuck in an infinite afternoon even as Anor Londo sits in darkness now. The world waits, enemies stuck in place until someone approaches, stuck in loops of their own, cycles of action reset on every death. Clockwork souls. Even Dusk isn't shocked by her own passing. She knows it doesn't matter in the end. She has just slipped off, between worlds again, waiting to be summoned back. In another place, in another time, by another person. This will all come round again, here as the cycle resets or in another world just the same. I've finished, for good this time. More confused, less content. The game doesn’t feel complete, merely empty. Maybe everyone else was right as I killed them, too. Curses on me, screaming out my madness. Going hollow isn’t really about the aggression afterwards, it’s the loss of hope that goes before. In a dead world, I find myself lacking anything to hold on to. I press on to the end. Through the ashen wasteland of the Kiln and towards the First Flame. Once Lord of Sunlight, now Lord of Cinder, Gwyn linked the fires first. I kill him and take his place, sacrificing myself to stoke up the flames again. Despite everything I uncovered on my murderous tour, I do this because Anastacia asked it of me. Before I can think, before I can know, the cycle continues. Dark Souls doesn't even jump to the main menu after the credits with an option to start a ‘New Game Plus’: it just dumps me back at the beginning, everything ahead of me again. All progress undone, level and items and equipment intact. All deeds undone, memories intact. I'm back at Firelink, running on instinct and the joy of trampling over challenges that terrified me the first time around. Everything is as it was, and as it always will be. All of it wound back up again, ready to tick along as though for the first time. There is no resolution. Cycles spin on and there's no way to break them. They must break you, you must give up like everyone else does. That’s the real heart of Dark Souls. Less ‘Prepare to Die’ and more ‘You Can’t Win’. The only choice is when to give up. I push on for a while covering familiar ground, passing memories. Anastacia, alive and silent, is trapped forever ready to die again. I’d grant her that peace this time. The aquaduct, Undead Burg. The first merchant, the first bonfire, the first boss. The first friend. I smile to myself. If I must surrender, then here’s the place to do it, on my own terms. I can use Lordran against itself. It rushes murderously, but only if I rush out first. It runs infinitely, but only if I push it. If I go nowhere then it stops. Far behind me, a dragon perches at the far end of the bridge, ready to dive down and scorch the stones. It can wait. Sometimes all it takes is a moment to change perspective: a moment in good company to shelter from the whirling beyond control. Such encounters used to sustain me; now I savour them. I know I’m not really the kind of player who kills everyone, but maybe sometimes it takes a little murder to find out why. The desire to prove myself—and the rush from doing so—overwhelmed my instincts. It’s not the big battles I will remember most fondly. It’s the smaller things, the meetings like this. Everything is there for me to find again, bright spots of humanity in a dark land. I stand with Solaire a while and we take all the time we need, looking out beyond the world. Sharing that which will sustain us all when gods and lords have passed and only we remain, taking in a light brighter than any bonfire and warmer than any illusion. “I will stay behind, to gaze at the sun. The sun is a wondrous body. Like a magnificent father. This piece was republised from nightmaremode.net with permission.